Baltic Amber Necklace - More Than Just a Pretty Necklace. When you think of healing an child's teething pain, you think of the most common methods of frozen teething rings or similar plastic items from which relief lasts less than a minute or pharmaceutical remedies that you rub on the gums (good for another minute or two). But then your child starts wailing again and you realize there has to be a better way. Well the good news is there is. Baltic Amber Teething Necklace work because they are not chewed on, but the substance within natural Baltic Amber, known as Succinic Acid, is absorbed into the child's skin and works with their immune system and central nervous system to provide a calming, holistic pain relief that is really as old as time. 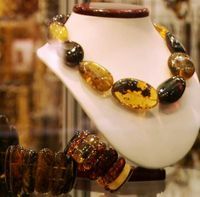 Millions of years ago, Amber was formed in ancient forests as resin which is warm to the touch. In providing pain relief, it absorbs the natural heat from the skin and in return, it relieves inflammation. When you discover this miracle for yourself, you will be also discovering numerous other health benefits from Baltic Amber but first, let's talk about how to choose your child's teething necklace. The best results from a natural Baltic Amber (which is the only kind of Amber with these capabilities) is with a necklace that is well made in the ancient tradition by Amber Artisans for whom this craft has been handed down generation to generation. They carefully string perfectly rounded beads with knots in between each to prevent beads becoming lost should the necklace break. This rarely happens since supervision is always required when the child's is wearing an Amber Necklace. Also, the necklace must be removed when the child is sleeping (or unsupervised). A few hours a day wearing the Amber is enough to get the full benefit of its healing ability. Once you begin your Amber search, you'll be fascinated by the impact natural Baltic Amber has had on societies as a treasure and a health remedy. You'll also wonder at the documentation by scientists of how amber has brought them phenomenal details about our past civilizations as well as scientists around the globe who have found and documented phenomenal details about our past civilization by capturing small segments of plants and insects in its path and crystallizing them. As it has left clues about our past Mineralogists know Amber as Succinate from the Latin succinum which is a conductor of energy. There are a number of tests you can do to demonstrate this capability. The Greek name for Amber is electron which, translated into English, means electricity. So now it's time to begin your own incredible journey into the world of natural Baltic Amber. And remember, the most important point to keep in mind is to look for authentic amber artisans who are completely in tune with Baltic Amber because they've grown up with it and live it every day in their hands as they create treasures for many more generations to come. Don't spend even one more day watching your child's discomfort. Natural Baltic Amber is nature's give to us, one that truly does keep on giving. Explore our amazing collection of Baltic Amber Teething Necklaces it can change your life in the best possible way.